In 2003, HSP undertook the Documentary Families Project, which focused on the access and preservation needs of some of the Society’s richest collections of family papers. This three-year effort enabled HSP to preserve and describe dozens of these important collections, which describe the founding and settlement of Pennsylvania, expansion into western counties and relations with Native Americans, and much more. Project staff (Joanne Danifo, Katherine Gallup, Sarah Heim, and Leslie Hunt) created this glossary of terms in financial records found in the Documentary Families collections. However, this guide may be helpful for anyone conducting research in financial records from the 17th to the 20th centuries. Researchers not accustomed to early penmanship, may also be interested in Kip Sperry's book, Reading Early American Handwriting (Baltimore, Md. : Genealogical Pub. Co., 1998; call number REF Z 115.A5 S64 1998). Before one begins studying business records, there are basic terms that should be understood. "Credit" refers to a positive balance and "debit" refers to a negative balance or money owed. When keeping track of credits and debits, a business lists its credits on the left and debits on the right or “contra.” For example, an account in a ledger would list a purchase on the left, because the account owes the business money for the merchandise. The payment for the merchandise is then listed on the right. Understanding the relationship between credits and debits and the usage of sundries is vital to reading account books and other financial materials in business records. The term account book can be used to describe many different volumes used in bookkeeping. The daybook is the most fundamental financial record for a business and may be referred to as a waste book or blotter. In this volume, an employee records the business’ financial transactions at the time that they occur. Daybooks hold the record of both debits and credits and two slash marks in the margin (//) signify that this entry was recorded in the bookkeeper’s next tool, the journal. A journal is the step between the daybook and the ledger. On a monthly basis, the bookkeeper copied the financial information from the daybook into the journal. However, the bookkeeper listed summaries of individual accounts under each date. The goal of the journal was to organize transactions according customer for each date in order to facilitate the creation of the ledger. The numbers that often appear in the margins of the journal correspond to pages in the ledger. Whereas daybooks and journals are organized by date, ledgers are organized by account. Under each account, there is a chronological list of the account’s debits and credits for said period of time. The front of the ledger contains an alphabetical index of accounts and the corresponding page number. Sometimes the ledger’s index is a separate volume. Often a business will want keep track of the amount of cash it has on hand, so the bookkeeper traces the flow of cash in a cashbook. The cashbook essentially is a daybook that contains only the transactions involving cash received or cash paid. One final volume worth noting is a business’ bank book, which keeps track of deposits and withdrawals. There are also many different types of financial records, but the main ones are bills, receipts, invoices, and account statements. The term "bill" is loosely applied to a document that contains a record of the buyer, seller, items purchased, prices and bill total. Invoices, which may also be referred to as "accounts receivable," are issued by a person upon the delivery of a goods or services. They are closely related to shipping slips, which make note of the method of delivery, usually by rail or ship. Recognition of payment can be written on the bill or a separate receipt is sent. A business may also have records of their receipts in a receipt book. An account statement lists the debits and credits an account. It follows the same format as a ledger, but might be as detailed as a daybook. One of the collections that contains almost every type of account book and financial document previously mentioned is the Hollingsworth family papers. The business of flour merchant Levi Hollingsworth is detailed in daybooks, journals, ledgers, cashbooks, bank books, shipping records, invoices, bills and receipts. While bookkeeping records shed light on the financial status of a business, there are also other materials that relate to administration, operations, relationships between business associates and customers, and other miscellaneous aspects of industry and mercantilism. Minute books are vital to understanding the operations and administration of a business. They have the details of meetings held by the governing members of a business and offer insight to their decisions and outline how the business operates. 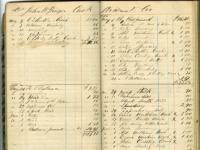 In the Perot family papers, the minute books trace the activities of a nineteenth century brewery. Many business collections include a great deal of correspondence. The Meredith family papers are rich in correspondence that sheds light on the late eighteenth and early nineteenth century tannery business of Jonathan Meredith. His letter books contain letters addressed to tanners, boot and shoe makers, coach makers, and a number of merchants and provide the researcher with insight into the process of tanning and the mercantile aspects of the business. In the Thompson family papers, John J. Thompson’s letters represent the type of correspondence that can most often be found in business records – inquiries concerning bill payments. Thompson and the members of his merchant firm wrote to different customers and associates on a daily basis in hopes of settling open accounts; the correspondence became more frequent during times of financial strife in a business. Other business records include inventories of goods. The Thompson family papers have sketches for patent applications relating to George Thompson's involvement in the Pennsylvania Salt Company. The Hortsmann-Lippincott family papers include ribbon sample books among the papers of Horstmann Brothers & Company and William H. Horstmann & Sons, which were nineteenth century textile companies. Some business collections also include employee information such as registers or wage lists. The employee registers in Hortsmann-Lippincott family papers offer details such as an employee’s hire date, duties, the room in which he worked, and his reason for termination, if applicable. Whether a researcher desires insight into the financial practices of a company, their daily operations, or the relationships between merchants, financiers, and manufacturers, a company’s business records can provide a great amount of information.